4/25/2018 - Proven Winners® will expand its National Plant of the Year program in 2019, highlighting four shrubs from the Proven Winners® ColorChoice® line, in addition to its Perennial and Annual Plants of the Year. The Landscape Plant of the Year program was started in 2016 as a way to promote particularly landscape-worthy shrub varieties to the trade and it has proven so successful that it has been expanded to include the Rose of the Year, Hydrangea of the Year and Flowering Shrub of the Year. Each will enjoy expanded trade, retail and consumer-focused promotional messaging. Activities such as postcard mailings, print advertising and increased visibility at upcoming trade shows, as well as expanded digital consumer advertising, is planned to get the word out about these special varieties and how to best use them in gardens and landscapes. In addition to these promotional efforts, Proven Winners® North America will feature these plants on their National Plant of the Year website. 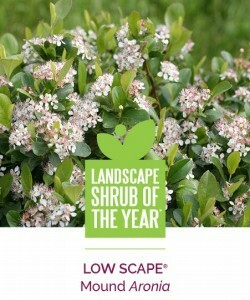 The 2019 Landscape Shrub of the Year is Low Scape® Mound Aronia. This dwarf Aronia is adaptable to most soils and offers dark glossy foliage, loads of white flowers in spring, black summer fruit and intense red foliage in autumn. Developed by Dr. Mark Brand of the University of Connecticut, Low Scape® Mound Aronia is a native plant and is ideal for low-maintenance, mass planting. 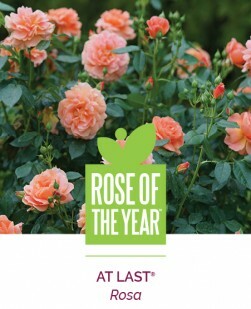 The new At Last® rose has been selected as the 2019 Rose of the Year. Its romantic, fully-fragrant, apricot-peach blooms, combined with the easy care of a landscape rose, makes this a truly outstanding variety. Glossy, deep green foliage that stays free of black spot and powdery mildew, plus a rounded habit with self-cleaning blooms, makes this Rose of the Year an ideal low-maintenance choice for landscapes and flower gardens. At Last® rose was developed by Colin Horner in the United Kingdom and has proved itself to be a consumer favorite, claiming the top spot in the 2016 “Shrub Madness” championship. 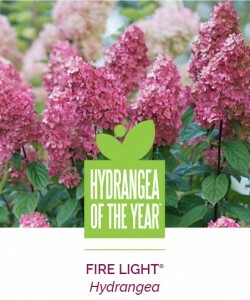 The 2019 Hydrangea of the Year is Fire Light® Hydrangea paniculata. Held upright on strong, supportive stems, its panicles are packed with florets which transform from pure white to deep pomegranate-pink as the season progresses. This very hardy hydrangea is adaptable to most well-drained soils and is also a Shrub Madness Champion from the 2015 competition. Finally, the 2019 Flowering Shrub of the Year, *Sonic Bloom® weigela, boasts the strongest reblooming ever seen in weigela. With loads of flowers in May followed by waves of blooms until frost, Sonic Bloom® weigela are good additions to mixed borders and make a great low-foundation planting. 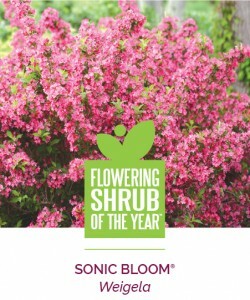 Growers can obtain the Proven Winners® ColorChoice® shrubs of the year at Spring Meadow Nursery, in Grand Haven, Michigan. A Growing and Landscape Guide is available for download to give growers and retailers full details about the 2019 Shrubs of the Year. *Sonic Bloom® is a registered trademark of the Syngenta Group. Proven Winners® ColorChoice® is the brand name of Spring Meadow Nursery, Inc., a market leader in flowering shrubs, potted liners, and starter plants. Located in Grand Haven, Michigan, Spring Meadow Nursery has over 500 varieties in their catalog, including over 280 varieties marketed under the Proven Winners® ColorChoice® brand, including Incrediball® hydrangea, Lo & Behold® butterfly bush and Bloomerang® reblooming lilac.